When you think of current generation Indian Cricket, who are your fans of? 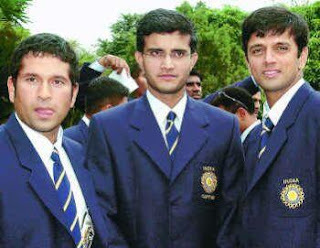 Sachin Tendulkar, Rahul Dravid, Sourav Ganguly, Anil Kumble? Or perhaps Harbhajan Singh, Yuvraj Singh, Virender Sehwag or Zaheer Khan? All of them were introduced into the team before 2001. When you think of Tennis in India, who do you think is currently performing the best? As of today, the few remaining players in the Australian Open draw consists of Laender Paes and Mahesh Bhupathi. Both are from the 90s. The guys who were supposed to succeed them - Rohan Bopanna and the likes - didn't really fire. Sania is perhaps edging on the border of excepting this trend, but again, what she achieved in the past 10 years pales in comparison to what these two achieved in the past 10 years. When you think of Bollywood, who do you think is still ruling the roost? The Khans (Shah Rukh, Salman, Aamir and Saif Ali) & perhaps Akshay Kumar & Ajay Devgun every now and then. All of them started in the 90s or before. What happened to the next lot? AB Junior, Roshan Junior, Oberoi Junior etc? Which present day Indian companies do you consider great? Infy? Wipro? TCS? Airtel? All of them were household names ten years back, though each of them were less than 10 years old. Which younger-than-10 year old Indian company commands the same respect? How many such companies exist? Try to ponder over this across more aspects - politics, Gurus, brands and so on. You will probably see the trend in other places as well. The more I think of it, the more I feel that somehow, India just stopped producing talent, in general, for a few years. It's not a fool proof theory, but just a general trend I see. I would love to see an argument proving otherwise, but for now - I feel that we somehow managed to lose a decade of talent creation. I don't know why it happened, but it seemed to have. Any thoughts? And on that note, wishing all Indians a very happy Republic Day. The constitution has served us well, and I hope it continues to do so in the years to come.